Earlier today I submitted the following response to the Single-Family Credit Risk Transfer Request for Input made by the Federal Housing Finance Agency (FHFA) in June. I appreciate the opportunity to respond to your request for input on the important topic of credit risk transfers for single-family mortgages owned or guaranteed by Fannie Mae or Freddie Mac. While the focal point of your request is “front-end” risk sharing (done prior to a loan being acquired by the companies), you correctly state, “FHFA must assess all Enterprise credit risk transfer activities using the same key principles and considerations….” My comments are aimed at this broader objective. Any discussion of Fannie and Freddie’s risk-sharing alternatives has to begin by acknowledging the highly unusual circumstances under which the companies and FHFA, their regulator and conservator, currently operate. While Fannie and Freddie both are profitable, the terms of the 2012 net worth sweep imposed by Treasury prevent them from building capital (and will lead to their having no capital at all at the beginning of 2018). Treasury has made no secret of its desire to see Fannie and Freddie “wound down and replaced” with some alternative secondary mortgage market mechanism. Yet it has no statutory authority or ability to produce this result, and the actions it has taken with the net worth sweep and in other areas have been challenged in numerous lawsuits, under several different theories of law. A victory for Treasury in these suits would keep Fannie and Freddie without capital and under FHFA conservatorship until they either are nationalized or replaced. In contrast, a victory by plaintiffs would reverse the net worth sweep and allow the companies to retain their earnings and regain access to the public capital markets. Pursuant to a capital plan filed with and approved by FHFA, they then would have a path to return to their former status of fully capitalized, shareholder-owned entities. FHFA’s request for input on credit risk transfers by Fannie and Freddie thus comes at a time when their future capital circumstances are highly uncertain. As discussed below, however, irrespective of which of the (diametrically opposite) outcomes for the companies FHFA views as being more likely, it should take the same approach to assessing the economics of their risk-sharing transactions. In its role as conservator, FHFA has the duty to “preserve and conserve the assets of” two companies, Fannie and Freddie, that have a proven and successful model of taking and managing mortgage credit risk. As companies with private shareholder capital, Fannie and Freddie always have had strong incentives to carefully assess and manage the mortgage credit risks they take, and their unique business model has enabled them to do so. They control credit risk on the front end through prudent underwriting standards and their ability to impose those standards on lenders who request a credit guaranty. The companies then minimize the cost of providing those guarantees through a unique and highly effective form of risk diversification—in very large volumes, and across products, risk characteristics, geography and time. FHFA will not be able to assess “whether [risk transfer] transactions are cost-effective” alternatives to having Fannie or Freddie bear credit risks themselves unless and until, as regulator, it follows through on the directive in HERA and develops and promulgates updated, binding risk-based capital standards for the companies. FHFA should do this immediately. The Federal Reserve has identified a 25 percent nationwide drop in home prices as the “severely adverse” scenario against which large and systemically important companies must be able to protect themselves. To determine the amount of initial capital Fannie and Freddie should be required to hold, by product type and risk category, to survive that level of stress, FHFA would use the companies’ historical loan performance data and reasonable targets for their return on capital to make projections of their cash credit losses, guaranty fees and administrative expenses under a scenario in which home prices fall by 25 percent. (FHFA also should update the capital requirements for the companies’ multifamily and portfolio investment businesses, which have risks different from the single-family business.) Updated to meet current standards of taxpayer protection, these single-family capital requirements and target guaranty fees, by product type and risk category, would become the reference points for FHFA to use in evaluating all potential forms of credit risk-sharing mechanisms, whether front-end or back-end. FHFA should adhere to a “borrower benefit” standard in making these evaluations: specifically, will the risk sharing techniques or transactions in question result in a lower all-in cost to the borrower, with the same or a better standard of protection for the companies and the U.S taxpayer, compared with Fannie or Freddie retaining the credit risk itself? Importantly, this stress capital-driven approach to assessing alternatives to Fannie and Freddie risk-taking will be valid even if Treasury prevails in the lawsuits, and the companies are not permitted to retain capital. In that case, the government effectively would become the owners of Fannie and Freddie, and instead of having to hold actual equity capital would be deemed to have “notional invested capital” equal to the stress requirement. As “owners” of the companies, the government should want to price Fannie and Freddie’s credit guarantees exactly as shareholders do: so that the fees charged fully compensate for the risks taken (as measured by required stress capital), while yielding an appropriate return on that risk-taking. Similarly, the government only should want to do risk sharing when what it has to pay in cost or give up in guaranty fee is more than offset by what it deems to be a reduction in risk—no different from the motivations of a private shareholder. For FHFA to implement a borrower benefit standard for Fannie and Freddie’s risk transfer activities, it will need to accomplish four tasks after it updates their capital requirements (and after the companies adjust their guaranty fees to these new requirements). First, FHFA will need to ensure that it clearly understands how each risk sharing mechanism and transaction type the companies potentially could use is structured and functions. Second, it will need to make accurate “all-in” assessments of costs to the borrower and changes in risk to the companies for each alternative. FHFA’s third and most difficult task will be to determine the exact amount of capital relief to grant Fannie and Freddie for each risk-sharing mechanism they use or risk transfer transaction they undertake, so that the companies will know the maximum reduction in guaranty fees they can offer for those forms of risk sharing and still pass their risk-based capital stress tests. Then, FHFA’s final task will be to combine all of the elements of the first three tasks and assess whether the increased costs (either to the borrower or to Fannie and Freddie) and lower guaranty fees associated with each type of risk-transfer mechanism or transaction produce an overall lower cost to the borrower—for equal amounts of risk-taking—compared with the companies keeping that risk themselves. There are three basic types of risk transfers FHFA will need to be able to evaluate: supplemental private mortgage insurance, lender recourse, and securitized credit risk transfers. Supplemental private mortgage insurance (MI). Fannie and Freddie’s charters require them to have some amount of private mortgage insurance (or its equivalent) on all mortgages they purchase or guarantee with down payments less than 20 percent. At their election, however, they may require greater levels of MI on these loans (known as “deep cover” MI), which typically will be paid for by the borrower. In addition, Fannie and Freddie may ask mortgage insurers to insure loans after they have been acquired (so-called “back-end” MI), in transactions the companies pay for themselves. After doing the risk, cost and benefit evaluations discussed above for these MI-related transactions, FHFA also must assess counterparty risk: whether the mortgage insurers Fannie and Freddie use have sufficient equity capital and loss reserves to meet their obligations to the companies. To test that, FHFA should apply the same stress test to all of the MIs used by Fannie and Freddie as it does to the companies themselves. If the MIs do not have sufficient capital to meet Fannie and Freddie’s stress standard, the companies will have to make up any capital shortfalls themselves (to pass their own stress tests). The existence of stress capital shortfalls at any MI will be a red flag for FHFA, meaning not only that voluntary deep cover or back-end arrangements with those MIs will not be economic for Fannie and Freddie but also that they should take steps to limit or reduce their exposures to those capital-deficient companies on the borrower-paid MI required by their charters. Lender recourse. In these arrangements, a lender agrees to cover a certain percentage of the losses on loans it sells to Fannie or Freddie in exchange for a lower guaranty fee. Lender recourse transactions typically are backed by collateral. FHFA’s job in these cases (in addition to determining the capital credit) will be to ensure that the collateral is of an amount and quality sufficient to cover the risks involved, and that all collateral agreements are properly executed. Should Fannie and Freddie wish to do lender recourse arrangements that are not collateralized, FHFA will need to assess their risks on a case-by-case basis. It generally will not be possible for FHFA to run stress tests on these lenders (most of whom are likely to be large commercial banks), so its assessments of counterparty risk in these cases will be subjective. For this reason, FHFA would be wise to limit uncollateralized lender recourse transactions to some small percentage of Fannie and Freddie’s required capital. Securitized credit risk transfers. These are, by far, the most challenging types of risk sharing transactions for FHFA to evaluate and regulate. Most securitized credit risk transfer structures are highly complex, with multiple unpredictable elements (including but not limited to mortgage prepayments and the amount, timing and severity of credit losses) interacting to affect the amount of risk actually transferred. For this form of risk sharing, FHFA will have the daunting task of deciding how much capital relief to give Fannie and Freddie on day one for structures whose ultimate value is uncertain, and indeed unknowable until many years in the future. The experience with Fannie’s Connecticut Avenue Securities (CAS) program shows just how difficult this task will be for FHFA. The two principal risk-bearing tranches of recent CAS deals (called “M-1” and “M-2”) are described as providing protection against credit losses between 1 percent up to 4 percent of the initial balance of the mortgage pools they are issued to protect. Yet the sensitivity analyses in Fannie’s own prospectuses project that the company will transfer no credit risk at all to the buyers of the M-1 CAS tranche, and show that there is only a small chance of transferring risk to buyers of the M-2 CAS tranche. This “intentionally defective” structure of Fannie’s CAS tranches makes them dramatically inferior to equity capital as protection against credit risk—so much so that the only realistic capital credit for FHFA to assign these “risk sharing” securities is something close to zero. In its request for input, FHFA states that Fannie and Freddie’s credit risk transfer programs “should consist of transactions in which the cost to the Enterprise for transferring the credit risk does not meaningfully exceed the cost to the Enterprise of self-insuring the credit risk being transferred.” Fannie’s CAS program badly fails this test. Fannie has committed itself to make billions of dollars in interest payments to purchasers of CAS risk-sharing securities that will absorb few if any credit losses, even in a stress environment. These deals are clearly, and grossly, uneconomic, and as it reviews its approach to evaluating future credit risk transfers FHFA must ask itself how it could have failed to detect that fact. The most likely explanation is that FHFA in its role as conservator set fixed goals for risk-sharing transactions for both Fannie and Freddie and then, as regulator, did not pay sufficient attention to how the structures of the CAS deals done by Fannie in response to that FHFA directive affected their economics. To avoid a recurrence of this problem in the future, FHFA in its role as regulator must not make any type of risk sharing for Fannie or Freddie mandatory (and it should unequivocally oppose any legislative proposals that do). Mandatory risk-sharing renders the forms of economic analysis that are the subject of this request for input moot, since by definition risk sharing that is mandatory will be done whether it makes economic sense or not. Mandatory risk sharing also transfers responsibility for determining what credit risks are insurable to third parties who may not be committed to providing mortgage credit throughout the business cycle, and gives those entities near-monopoly pricing power, to homebuyers’ detriment. FHFA now is conservator of two companies that for decades have been the gold standard of single-family mortgage credit risk management. Their business model of prudent underwriting, at-risk capital, and unparalleled abilities to diversify credit risk has provided consistent access to low-cost mortgage credit, at loss rates unequalled anywhere else in the industry, to a wide range of borrower types in very large volumes across the business cycle. It is FHFA’s responsibility to reinvigorate this business model by giving it updated capital standards that incorporate the lessons learned from the financial crisis. Then, FHFA should apply the approach and standards detailed above to ensure that any mechanisms or transactions used to transfer credit risk away from Fannie and Freddie are at least as efficient and effective as what the companies can provide through self-insurance, so that neither the cost nor availability of mortgages to homebuyers is affected adversely. The MBA crowd seems to think that the CSP is really taking off and that private capital will be coming in strong. I believe you have a different view on this. Do you think that Rodrigo Lopez is making an accurate statement? I apologize for the delay in answering your question, but I’ve been traveling today. While doing so, though, I’ve been able to all but finish up a post that I’ll put up tomorrow morning, and I think it will be responsive to your question about the role of “private capital” in the future mortgage finance system. The CSP (which I only touch on in the post) is intended to serve as a platform for the entities or mechanisms that are assumed to replace Fannie and Freddie in the future. And as you’ll read in the post, I believe that neither of the two most prominent (and similar) models for replacing the companies– the “Promising Road to GSE Reform” from the Urban Institute and “Toward a New Secondary Mortgage Market” from the Milken Institute–could possibly work in the real world. I continue to believe that without a credible alternative to Fannie and Freddie, which in my view has yet to be developed, the CSP does not pose a great threat to them. One observation on Mr. Lopez’s comment–and naturally a cranky one given my MBA perspective–is to remind the new MBA official that the CSP represents F&F’s capital which has been shanghaied and invested in the CSP, which he demands now should be available to a “whole variety of lenders.” (When have F&F’s commercial services not been?). Ironically, the big banks and the MBA–and their fellow travelers–the people to whom he wants the CSP ceded–haven’t put in one dime in development costs. Yet, they have spent a lot of time trying to brutalize or do away with the GSEs. Now they are demanding the spoils of the CSP creation…..free. Some of us still want to see the GSEs emerge as viable shareholder owned companies, possibly in utility format, and at that point discuss what GSE services should be shared with the industry or come with fees and charges. Someone might want to ask Mr. Lopez when the last time was that he gave anything away for free, save his opinion? Not in any detail. I’ve looked at the CBO piece briefly. By its authors own admission, the proposal “would not restructure the housing finance market; rather, it would allow the GSEs to retain some of their profits and thus increase their capital.” FHFA could do the same thing administratively, if it wished to, simply by allowing the companies’ Boards of Directors to decline to declare senior preferred stock dividends to Treasury (under the net worth sweep) until the companies build a capital cushion FHFA deems to be sufficient. Had the authors of the CBO piece known that, they could have saved themselves a considerable amount of work. Thanks. you made my day! ha ha . I am still laughing because of your last sentence. On the other hand it is so sad to see the anti-American attitude of FHFA. In way CBO is right, because FHFA is not allowed to make these decisions under PSPA. For all practical purposes, FHFA sold out conservatorship along with FnF to Tsy thru PSPA. In a way FHFA is not a independent authority as for as FnF are concerned. I don’t follow the argument you’re making. The PSPA does not override the Housing and Economic Recovery Act (HERA), and under HERA FHFA as conservator is not subject to the direction of any other federal agency, including Treasury. I understand that FHFA currently is not abiding by this provision in HERA–that’s one of the issues being contested in all of the lawsuits. But if FHFA cannot statutorily allow Fannie and Freddie’s Boards to retain capital, who do you believe can, and what do you believe gives them that authority? Thanks, We all agree with you. We respect your expert analysis and opinion. So far PSPA and HERA jurisdictional-bar claims have trumped all other laws including common sense and supreme law of the land. Even law makers questioned FHFA Director about PSPA and also sent letters to FHFA and Tsy. It looks like plaintiffs did not file correct complaints in the beginning and also plaintiffs did not have all the crucial information that was hidden from them. Eventually it may be unconstitutionality of HERA provisions that may prevent jurisdictional bar claims and end this conservatorship charade. Do you have any comments on front end verses back-end CRTs? I saw that FHFA got 37 responses to their request for input on credit risk transfers (CRTs). I’m slowly making my way though them (most are not easy reads), and will be making comments on front- and back-end CRTs both in my next post and in responses to specific questions about them. You are not only best expert in mortgage finance but also reliable and most articulate expert. Your service to nation is most valuable especially when so many lobbyists are confusing the public..
After reading all the proposals and their amendments at UI, do you find any way to wind down FnF and still keep the fixed rate 30y mortgages without increasing the cost to home buyers? No, I haven’t seen anything yet that I think will be an acceptable substitute for what Fannie and Freddie were able to do pre-crisis. I’m planning on putting up a new post next week that critiques the most popular reform proposals. Thanks for all you are doing on this issue. If you have covered this elsewhere, I apologize. There have been multiple sales by FnF of “under-performing/non-performing/reperforming” loans. Proceeds amount to many billions of dollars. Is this in the best interest of the shareholders? Was there value assigned to these loans when companies were put into conservatorship? I have not looked into these loan sales in detail, but I suspect the companies would not be undertaking them if they were not in conservatorship. When I was at Fannie Mae, it was more effective at conducting workouts of non-performing loans, and disposing of real estate owned (REO), than any other entity in the industry. It’s possible that the scale of Fannie and Freddie’s non-performing loans and REO, as carryovers from the crisis, is such that they don’t have the resources to manage them all effectively–and for that reason it makes economic sense to the companies to sell some of them. I think, however, that it’s more likely these sales are part of the larger program being carried by FHFA out at the insistence of Treasury: for Fannie and Freddie to move much of their business– be it credit risk management or distressed asset management–to “private sector” sources, irrespective of the economics. Should that in fact be the case, the sales would not be in the best interest of shareholders. Have you looked at CFPB opinion in the appeal courts? If yes, could you provide some thoughts on this? Some think it’s good for our case while others say it’s nothing. The securitization solutions suggested in the following article, A Simpler Path to Housing Finance Reform?, seem crazy to me. DeMarco wants to now use Ginnie Mae to securitize mortgages. Do you think this crowd is trying to work against the clock, if not fate, to get their securitization scheme to work? I don’t want to speculate on why advocates for a securitization-based mortgage finance system are making their proposals, or on the timing of recent articles; I’d rather focus on the proposals’ substance. As I mentioned in a comment below, I’ve been corresponding with the some of the authors of the “Promising Road” proposal–which while similar to the DeMarco-Bright recommendation I think is a slightly better version of it– to get their responses to my criticisms of what I believe to be the flaws in that model that make it inferior to the utility model I proposed in my “Fixing What Works” essay, and in fact make it unworkable (in my view). You’ll hear more from me on this topic in the future. Granted, I may have been overly skeptical, but if the “Promising Road” authors would include minority groups, stock GSE holders and American home buyers in the discussion of housing reform, they would be more successful in their revision efforts to open up the mortgage market to competition. Because of your financial expertise and background, I believe your utility model is the best solution, but you have several political hurdles to overcome. For example, who would agree to a 2 percent capital cushion, as much sense as that might make, with a trillion dollar portfolio of mortgages? Thanks for your efforts and financial insights. I have not proposed a two percent capital requirement for Fannie and Freddie; I have proposed a risk-based capital standard, with each company’s required capital being dependent on the mix of business they do. I would have Fannie and Freddie’s regulator, FHFA, set capital standards for risk “buckets”–at a minimum combinations of loan-to-value ratios and credit scores–with the capital ratios for each bucket being the amount necessary to absorb the credit losses FHFA projects would occur following a 25 percent nationwide decline in home prices over a five year period (plus some additional cushion for conservatism). With this approach, Fannie’s or Freddie’s required capital would depend on the risk mix of the business they do. My two percent number is a proposed minimum– meaning that even if the companies do only very low-risk business, their capital could not fall below two percent. This minimum is designed in part to be conservative, but more importantly to give Fannie and Freddie an incentive to do a representative amount of higher-risk business, rather than be able to hold their risk-based capital requirement down (below 2 percent) by limiting their credit guarantees to “squeaky clean” mortgages. Very interesting explanation because most of us “read” that you proposed 2% capital and I think that a lot of stakeholders read it in the same way, without paying focused attention to what you said. Maybe you should think if it is worth it to explain again the issue in a separate post, and give some examples using LTV -Credit Score combinations in order to expose how unnecessary it may be go to 10% capital like some lawmakers were (or still are) preaching. I’m sorry for my misstatement concerning your suggestions on risk-based capital requirements, but misunderstanding of these suggestions could result in political opposition. Therefore, your clarifications of risk-based capital requirements may be helpful here. However, a court victory in the way of a judgement in favor of GSE shareholders may be required to give you political sway. The bigger aim here is to put the GSEs and housing market on stable ground, safeguarding them from political meddling and market excesses. What are your views on the model of Federal Agricultural Mortgage Corp. (AGM)? It’s been quite a while since I’ve looked into this company (which we used to call “Farmer Mac”). As it relates to the topics we discuss on this site, however, I don’t believe Farmer Mac has much to offer in the way of ideas or as a model for the secondary mortgage market of the future. It looks like AGM is publicly traded stockholder company (mainly held by originating private FI) but it has explicit US Gov Guarantees. It appears if it benefits private FIs then explicit US Gov Guarantees are ok. But if it benefits individual stockholders then it public losses and private losses. Tim, seems like so much good stuff is happening lately. Let’s hope this whole thing get reversed, we sure deserve justice ⚖. Been patient for many years. “Recently unsealed Court documents point to Urban Institute senior fellow Jim Parrott as being involved in either misleading the president or partaking in misleading a Federal Court . The question now is how can the Urban Institute continue to consciously allow Parrott to publish as a fellow under the banner without jeopardizing their credibility or non profit status? The fact that Parrott is one of the authors of the promising road makes the proposal a “joke”. I welcome Josh’s contributions and insights on these issues, but think my most effective role is focusing on their substance and the analytics. I’m currently corresponding with some of the “Promising Road” authors in an attempt to get a better explanation of what I see as weaknesses in their proposal, compared with the utility model I offered in my essay for the Urban Institute, “Fixing What Works.” I’m sure you’ll see more on this topic in future posts. Tim, did the other authors reach out to you? No, I reached out to them. Tim, your writing is so precise and to the point. I truly hope FHFA listens to you. Do you know if there are any more people in influential government positions who agree with your views (if not knowledge) on the GSEs? If there are I haven’t found them yet, but I’m still early in my search. You must of been a wonderful person to work for and with! Would someone please give me exact instructions on how to forward this entire Tim Howard article on Mortgage Finance, including the Replies, to my Congressman and Senator. Thanks. I would suggest that you print and mail the amicus curiae that Tim contributed to Delaware case instead of this post. It is a work of art that puts the whole history of Fanniegate together in a few pages. Easy to read , easy to understand and makes a point on why all Congressmen should stand for the GSE . While I do support sending the Amicus link mentioned to your representatives I would not recommend sending it “instead of” Mr. Howards blog link. Far too much important and easy to read information here at the HowardOnMortgageFinance.com blog. Thanks a lot for standing for truth. Few people like yourself truly make the country great! Very good advice to FHFA. Wish Fellow Travelers start thinking like you. 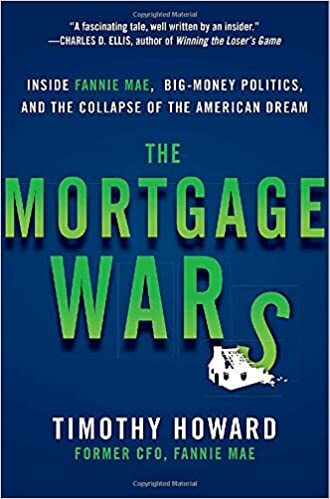 “I beg you to read and support the following solution to the current mortgage issue regarding Fannie and Freddie and shareholder rights in addition to how an improper attempt to resolve the matter will negatively affect non shareholder households and the USA and world economy. Everyone please send it to you senators and congressman. I did. Forwarding this to my state representatives, the Trump and Clinton organizations and the White House. I assume Mel and Treasury will get a copy. Same with Urban Institute. Great, send it to whomever, I have, but best sent to your two US Senators and your US Representative. Chances are he/she won’t understand it nor will their staffs, so consider a simple one paragraph explanation of what it is and where it fits. “In response to a request by the Federal Housing Finance Agency (FHFA) for comment, Mr. Tim Howard……as your constituent, I endorse Mr. Howard’s views because…..! “To test that, FHFA should apply the same stress test to all of the MIs used by Fannie and Freddie as it does to the companies themselves.” Well said! How does anybody know if these MIs will even be around during a serious financial crisis? See my brief reaction to this proposal, a few comments below. I do not think FHFA will understand anything. If they do, they will just ignore this. All this FHFA exercise of taking public inputs is sham.. to show they are doing something..
will all comments to fhfa be available for review? I am not sure about that. I will be traveling for most of the day tomorrow, but will check as soon as I can and post an updated response. I’m not sure why they say “in general” before saying “all input received,” but with that caveat it does sound as if submissions to FHFA in response to their Request for Input will be posted on their website sometime after the due date, which is October 13. This scares me as a stockholder. How likely could they do this? It should. Cuz they’re messaging the deal in the works. Perry and Berkowitz own preferred shares — not common shares — for a reason. The only way Treasury can pay-off their TBTF crony hedge-funds is on the backs of small individual and Main Street common shareholders. I had an opportunity to read the DeMarco/Bright paper this afternoon, on a long plane ride. It’s almost exactly the opposite of what I recommended in this post. DeMarco and Bright start by ruling out any solution involving Fannie or Freddie—using catch phrases (“failed business model”) and false characterizations (“private gains and public losses”) as their rationale, while ignoring the fact that Fannie and Freddie performed far better than any other source of mortgage finance throughout the financial crisis. By dismissing the Fannie/Freddie model out of hand, they avoid having to compare their idea with a superior, proven alternative. Their idea has two main elements. The first is that Fannie and Freddie would “be passed through receivership and reconstituted as entities mutually owned by their seller-servicers.” (Translation: “shut them down and give their business to the banks.”) The second is to have Ginnie Mae put its full faith and credit guaranty on conventional mortgages, after these mortgages get credit enhancement from “FHFA-approved credit enhancers that arrange for the required amounts of private capital to take on housing credit risk ahead of the government guarantee.” DeMarco and Bright claim their proposed system would provide 600-700 basis points of credit loss protection, but the first 400 basis points comes from (you guessed it) some unspecified form of risk-sharing transactions, and the other 200-300 basis points is “soft” capital invested by lenders who own the credit guarantors mutually. I have multiple criticisms about this proposal, but my biggest is its stunning level of naivete, or irresponsibility (I’m not sure which). DeMarco and Bright boast that none of what they’re proposing is really much change, because Fannie and Freddie share 80 to 90 percent of their risk in the capital markets now. No, they don’t. They issue securities that pretend to take credit risk but in fact do not; if sizable credit losses really did occur, Fannie and Freddie would get stuck with them. Do DeMarco and Bright truly not know that, or do they just not care? You ask how likely it is that we could do something like this. I believe not likely at all. Right now you have individuals like DeMarco and Bright, who have little practical knowledge of how the credit guaranty business works in the real world, starting with a pre-determined objective and then making up a fictionalized version of the mortgage and capital markets in which everything works the way they’d like it to. But if something like this ever got serious legislative consideration, credible people who actually do know that they’re doing—and understand the disaster that would ensue if we tried anything remotely similar to this—would step up and speak out. And that would kill the idea, even in the Congress we have today. I must disagree. Naive, irresponsible and little practical knowledge is the charitable read. I prefer crafty, intentional and acute single mindedness. These guys know exactly what they’re doing and for whom. Let my clarify my statement: I think DeMarco and Bright definitely do know what they would like to do (and for whom); they just don’t know how to do it. Their proposal assumes that they can find $200 billion of credit risk absorption capability ($5 trillion times 400 basis points) through risk transfers to the “private capital market”. That’s preposterous. Capital market investors do not have any significant appetite for mortgage credit risk in derivative form (i.e., as risk-sharing securities). Fannie’s CAS deals prove that. In order for Fannie’s investment bankers to sell the volume of CAS tranches FHFA is requiring them do to, the bankers have had to remove almost all of the credit risk from them by having the tranches pay off quickly (so that they’re not outstanding if and when the credit losses occur). All of Fannie’s CAS and Freddie’s STACR notes sold to date probably will transfer less than $1 billion of credit risk to these investors. So, just $199 billion to go under the Demarco/Bright plan. Capital markets investors WILL take mortgage credit risk as equity in companies whose job it is to acquire it and manage it prudently, as Fannie and Freddie do. But DeMarco and Bright rule out anything that looks like Fannie and Freddie from the outset. That leaves them with private mortgage insurers–which collectively have about $10 billion in equity capital– lender recourse (which has been around forever and never been used very much) and the new shiny object, securitized risk transfers. To think they can finance a $5 trillion market by transferring credit risk to these sources is, as I said above, either naive (DeMarco and Bright really don’t understand the markets they’re proposing to re-engineer) or irresponsible (they do understand them, but are willing to gamble that once they put Fannie and Freddie into receivership something will appear magically to take their place). I don’t know which it is, but both are equally dangerous. Seems their plans have one thing in common, to kill the existing shareholders. How un-American is that! It would be different if the companies failed, but they are actually trying to steal ownership and give it to others. Just so Banana Republic and a path this country should not go down which has consequences if they do! By its importance, the comment itself should be a separate post. But, with your superlative recital of what is necessary for FHFA, you’ve scared the crap out the those bureaucrats since now–if they are honest at their task–they’ll have to meet your standards and tests and won’t be able just to “wing it,” i.e. their stress tests. That type of shorthand or “fire, ready, aim,” often was their past practice because few people were looking over their shoulders and/or understood the agency’s tasks..